For the retail salesperson on the go, our collapsible salesman rolling rack offers the perfect solution to effectively display your merchandise. 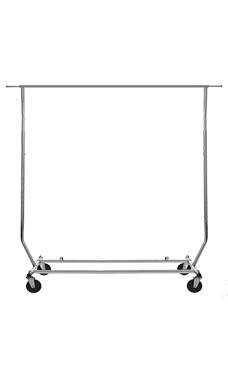 A rack with an attractive chrome finish lends itself to a variety of uses inside your store. Under 30 lbs., this rack easily collapses down to an amazing 4” and can be stored easily in a vehicle, closet or under the bed.